It’s almost December! Not only does this hail the arrival of Summer, but the end of year break as well. Across South Africa business owners and managers alike are racking their brains to plan the next stuff function, but perhaps the answer lies in a great day out with your team. And what better way to enjoy some shade than some branded gazebos or beach umbrellas? There’s all manner of activities you and your colleagues can enjoy in the sun; from a day at the beach to picnics in parks. And if you really want to get your team on board, there’s nothing like some competitive spirit. These teams are having a blast! They’ve picked their colours for the event, and they seem to be bonding well! This is more than just a end of year function, it’s a chance to make memories for the office. It almost seems genius, combining team building with a year end function,it’s brilliant stuff! And everyone loves a good competition. With big enough teams/departments the battle to be rulers of office, with all the bragging rights and fond memories that come with them, your employees will be eager to get on board. But how to set it up? Regardless of location or activity, shading and identity is the first step. You want it to be a pleasant experience, you don’t want your employees going home with 3rd degree sunburns to remember the day by. Probably not fondly. These are just a few of some of the competitors that participated at Team Olympics competition. This is exactly the sort of fun team identity we’re encouraging. Take a look here for more details on the event. Branded beach umbrellas or branded gazebos for larger teams can be customised to add some team identity and spirit to the event. Names, colours and pictures printed on their personal shade area not only empowers and unifies teams, but with your company logo added to it you spread the message that your company is one that really cares about and knows your employees on a fundamental level. Games and team building don’t have to be limited to colleagues enjoying a year end function. Friends and families can enjoy some competitive fun as well, and if not having your own ‘brand’ identity can be fun for friends and family. It’s not just businesses that have a brand identity, your family or friend circle does. The comedians, the Dungeons and Dragons warriors, the goofballs, the sports fanatics, the party animals or the arts. Everything that makes your family what it is, everything that brings you and your friends together, that’s something that makes up your brand. These families know exactly what we’re talking about! Lots of smiling faces, war paint, homemade flags and colours made to match. We can see some family branding going on! You can also have competitive team activities like sand castle competitions, three-legged races, egg races and so on and so forth. 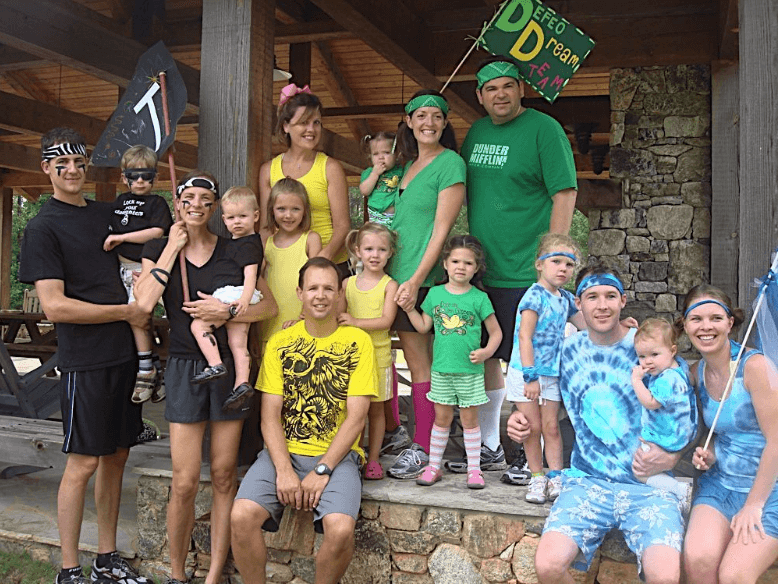 Husbands vs wives, gals vs. bros, and families vs. families, it’s a time for team spirit. There’s plenty of friendly fun to be had, and with some branded shading you can have a designated resting/dining area for your family/friends/team that provides much needed shade from the sun. Particularly for little ones, who can burn easily when exposed to too much sun. Image Text: A family dinner and get-together can be a heartwarming time. And out in nature it beats lunch/dinner in a restaurant any day. You can also use umbrellas to the same effect. A village of branded beach umbrellas, all catered towards teams or families, can create a colourful spectacle for others to admire while you enjoy some well deserved shade and relaxation between activities. Just because they’re smaller doesn’t mean they can’t be useful to large gatherings. Image Text: Courtesy of Blue Cotton Memory, a beach umbrella village is a fun way to enjoy the space together. And you each have your own designated spot of shade! Looks like paradise to us. The mix of colours and umbrellas indicates different areas of the family nicely. With this in mind, don’t settle for a restaurant family dinner or an office party for your year end function. There’s plenty of fun and exciting things that you can do to make your gathering fun, exciting, competitive, or simply uniquely YOU. Take a look at our branded gazebo and branded beach umbrella section for more information.